One of the virtues of spending 9 hours on an Aeroflot airbus (twice) is not the food, but getting to choose from a rather different menu of film and video choices. The Russian adaptation of Boris Akunin’s The State Counsellor was very well done (Oleg Menshikov’s representation of Erast Fandorin is a nicely judged exercise in detachment), but a film that was new to me was Yaroslav. A thousand years ago. It turned out to be a perfectly serviceable blood and guts tale of the heroic eleventh-century Christian prince Yaroslav and his struggle against both marauding bandit-slavers and treachery within his own circle, having to win over the pagan Bear tribe to triumph. It’s not great art, often quite formulaic and at times gratuitously gory. But there’s some nice representations of medieval Russian wooden towns little different from those of the mainline Mythic Russia era, you see the role of ‘Varangians’ – Vikings’ – as mercenary stormtroopers of the time, and it’s an undemanding and fun way to while away a couple of hours. 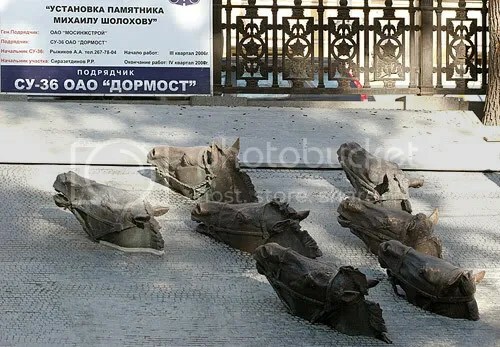 …and who knows what surreal sights he might see, from horses swimming through concrete to paying his respects to Dmitri Donskoi, blessed by Sergius of Radonezh before he set out to challenge the Mongols at Kulikovo…?